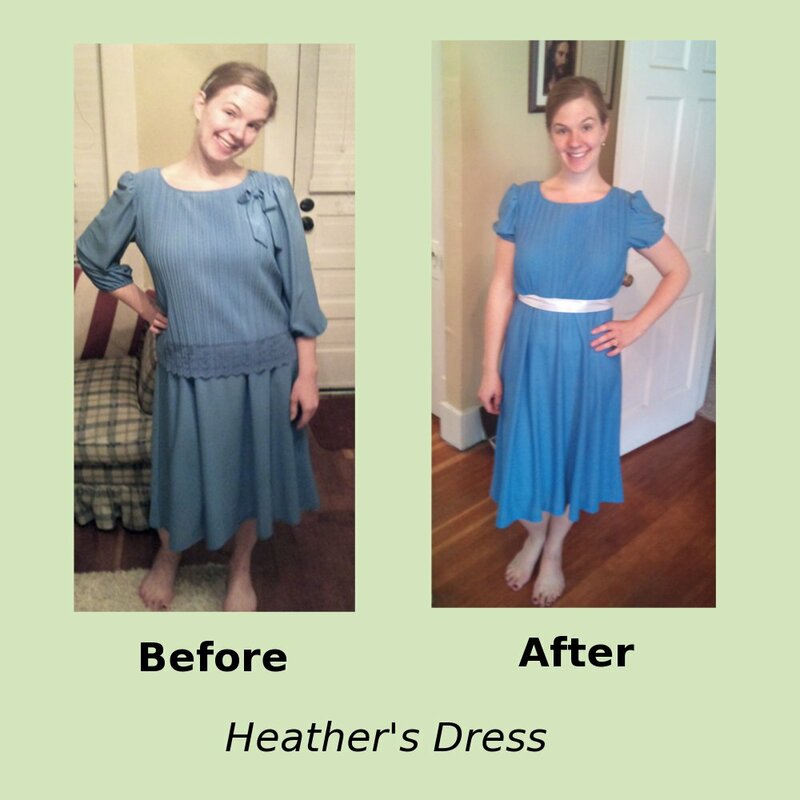 Women in the Scriptures: The Great UpCycled Dress Challenge! The Great UpCycled Dress Challenge! My youngest sister is an aspiring fashion designer and a few months ago she and I had a lot of fun looking through a blog called A New Dress a Day. The blog started when the author challenged herself to wear a new dress every day for a whole year, but she could only spend $365 the whole year. So she found ugly used dresses and altered them into things she could wear. She had some really ugly dresses and it is amazing to see what she did to them. Her before and after gallery is really fun to look through. and then we got sewing! We both discovered that altering a dress is so much faster than sewing one from the ground up. Once we both figured out what in the world we were going to do with these atrocious dresses the sewing part actually didn't take that long. It was so much fun to see what the other person came up with! 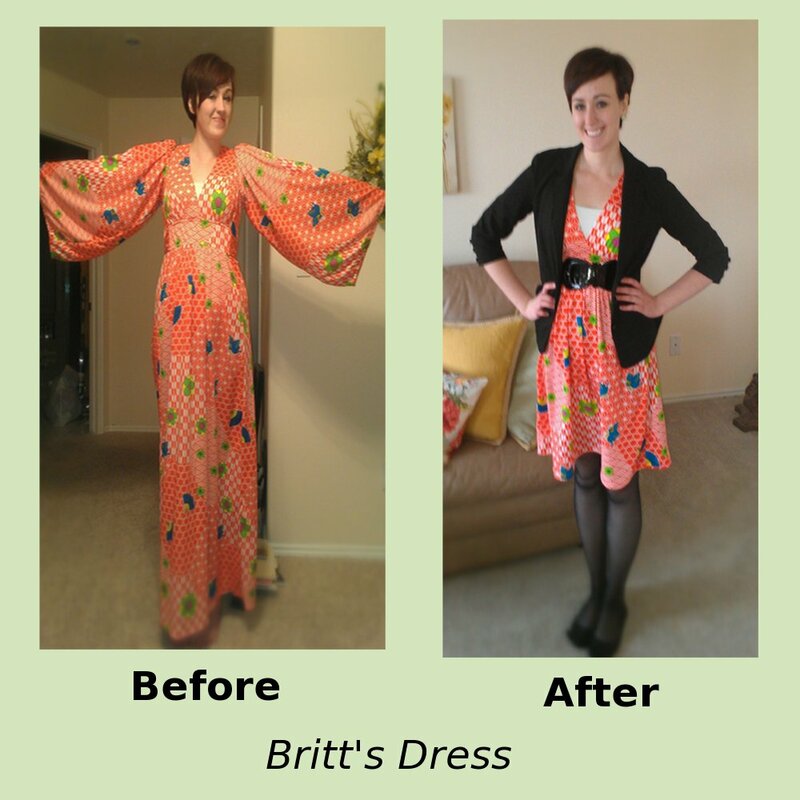 Here is my sister's (Britt) dress before and after. Oh, and I apologize in advances to any of you who owned and actually wore dresses like these. I am sure they were in style, once upon a time... eek! Didn't she do a great job? She took off the parachute sleeves, made the arm holes smaller, shortened the dress so that it didn't look like a tent and took off the sash. I don't think the picture gives you a good enough sense of how atrocious the fabric is on this dress. Orange with psychedelic flowers. Yuck. But she accessorized it so cute that the crazy fabric doesn't stand out so much. She was so excited to wear it to school and looked so stylish in it. She has talent! Here is my dress before and after. To change my dress I took off the bow thingy, took out the shoulder pads (honestly, I have just never understood the appeal of shoulder pads), shortened the sleeves and put elastic in them, took off the lace, cut the scrunchy material shorter and sewed it into the bottom of the dress, and added a ribbon I bought for 2 dollars. I was happy with how it turned out. I actually got a few compliments on it when I wore it, even before people saw the "before" picture. But man, I had to wash it in heavy duty detergent to get the old lady perfume smell out of it! Ick. But now it smells nice. And no, I didn't change the color. It was just the time of day the picture was taken that makes it look different. As you can tell my sister and I have very different fashion styles but we were both so impressed with what the person did to their dress. It was really fun and we both agreed that we will have to do this again in the future. It is a great way to get cute dresses really cheap! To finish off our competition though we want to have people vote on our dresses, to see who made the biggest change and who ended up with the most wearable dress. Whoever wins has to take the other person out to dinner. So even though this is my blog PLEASE don't just vote for me... though you can if you want to. We really want to know what people think! The polls are on the sidebar of my blog so if you are in Google Reader you will have to click on over and take it. I would love it if you would take a minute to vote. The stakes are pretty high! My two year old helped me vote. She liked the orange one better. :) Honestly you both did a great job! So impressed! Awesome! what a great idea! Amazing what Brit did with that thing- might as well been a mumu! Shoulder pads were used to make the waist look slimmer. You know, big shoulders, tinny waist, probably big hips. I was wishing today I could go shopping- even to a thrift store, but money is so tight, however after seeing this, I think I just might! I should offer this challenge to my daughters! Or wouldn't that be a great YW's activity? You both did a terrific job! Great job! I've seen that blog too and thought it was great. I think yours is really good for where you are at in life- it looks like a mom dress, but not in a bad way! Hers looks more trendy and is probably perfect for where she's at in life right now. Oh, wow! You are both so creative, and I actually wouldn't mind having a dress like yours. I voted for the dress that I would most likely wear - yours!! Ha, this is awesome! I actually really like Britt's before dress too! :) You both did a great job! Super fun! My sister and I could totally do something like this and it would be so much fun. Great job both of you! Amazing! Just one more reason you, Heather, are fantastic! That is REALLY awesome, and fun! Great jobs! Honestly, I think that your dress was MUCH uglier to start with. I actually liked your sister's dress before as much as after...but I'm kinda into that Asian kimono style. I love using old clothes to make new. I also didn't think Brit's dress was that bad :) Maybe in real life the colors would have been a bit worse. I agree with Montserrat - this would be an awesome YW challenge. Even a Relief Society challenge! Then you can all wear your "remade" dresses to Church together! Hmm... You've got gears moving. I would totally wear Britt's "before" dress. But the after one is even cuter. What a fun challenge! I do really love your blog, but I have to vote for Britt's dress (and not just because we Britts need to stick together :P ) I'm amazed with what you were both able to do with such crazy starting points. Both dresses turned out awesome and I'm totally impressed.